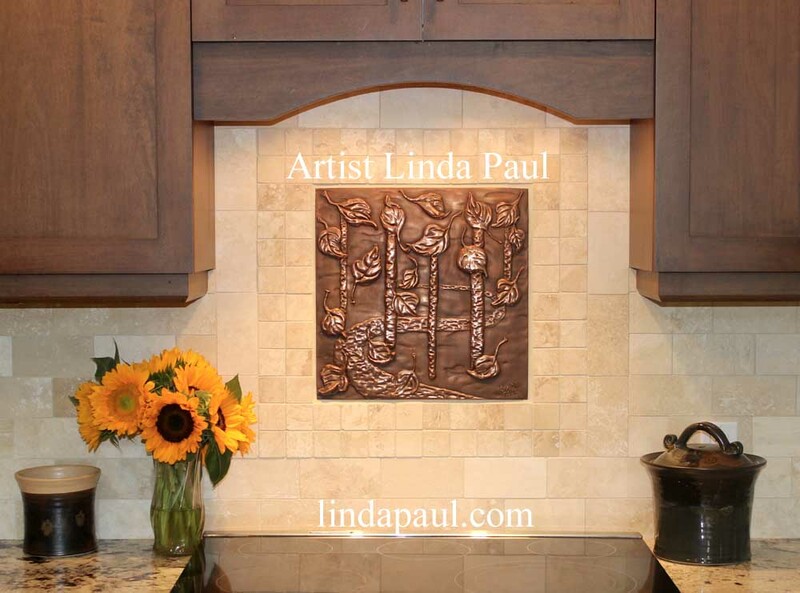 Falling Leaves backsplash plaque by artist Linda Paul. 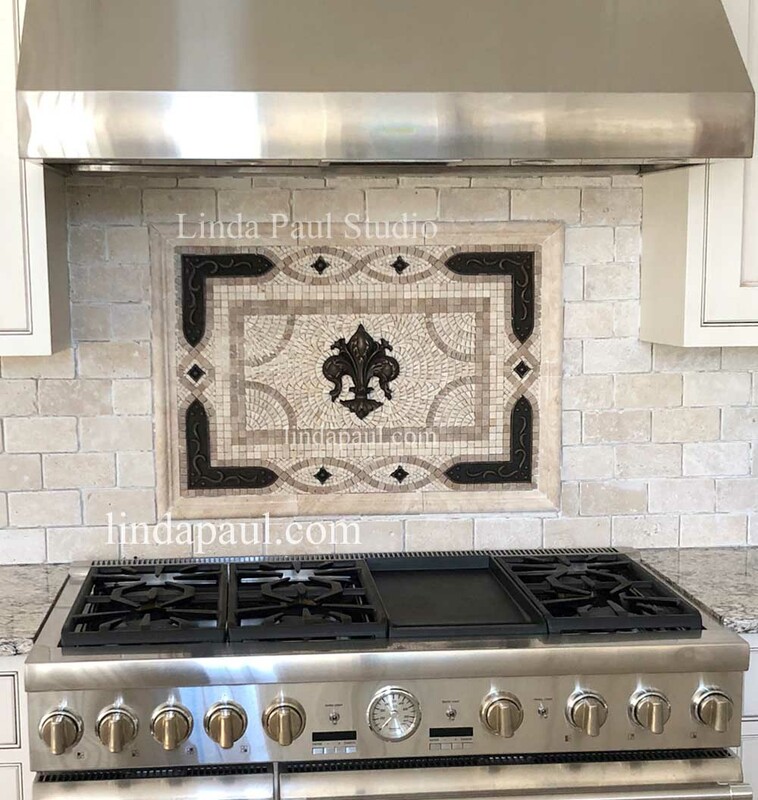 Our custom Grand Vienna Medallion 31" x 21"
“I have received many compliments including the use of “stunning” following the upgrade of my kitchen which included a new Carrara marble backsplash, the Sole Journey Mural with the ivory marble pencil border tiles.“ Thom Hartle, Denver, Colorado October 2017. We love our mural of Wild Horses and have installed it in our kitchen. 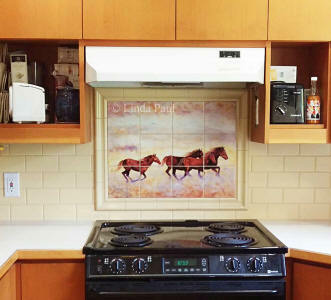 We looked at many horse tiles but yours depicted exactly what we were looking for, they are just beautiful. Our installer was also very impressed with the professional quality of the tiles. 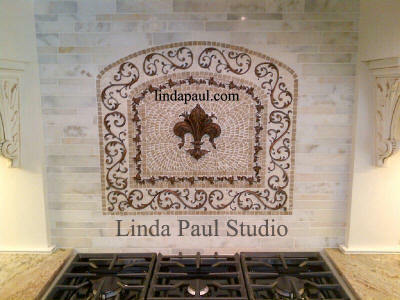 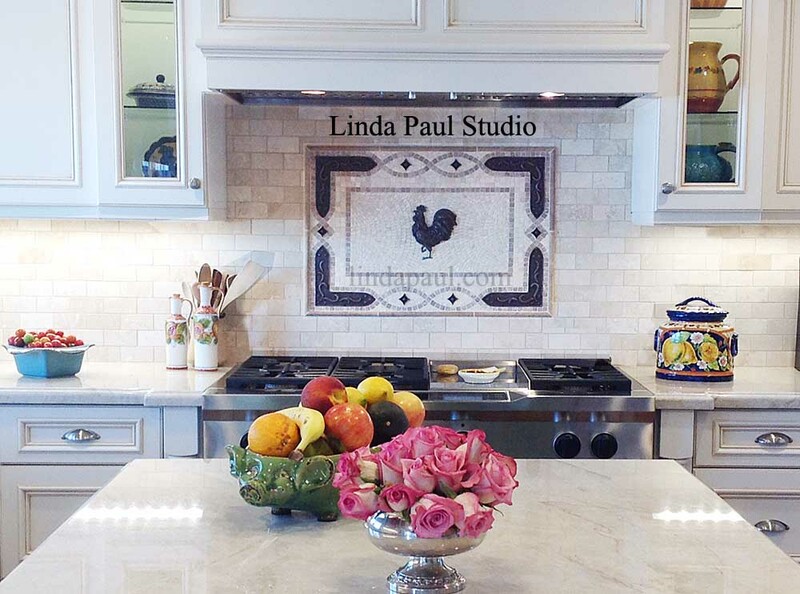 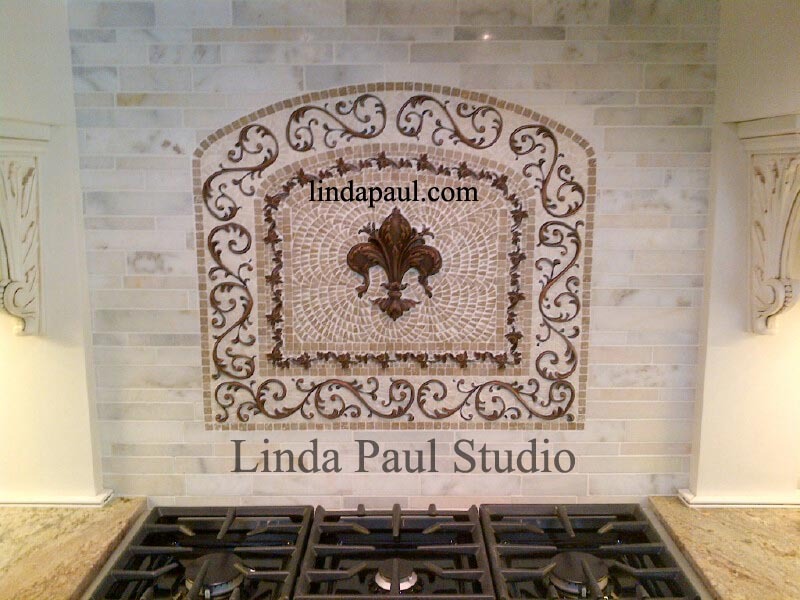 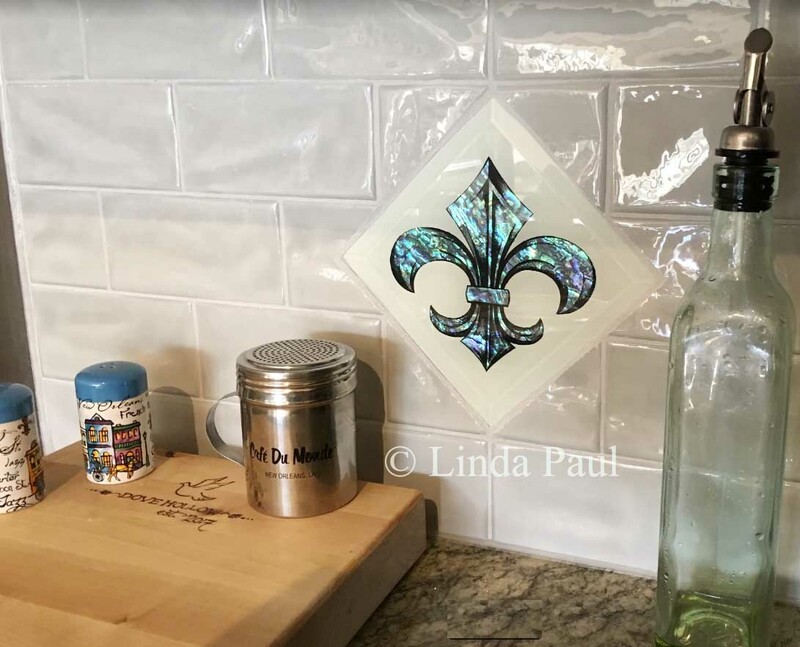 This is our stock 24" x 24" Grand Vienna fleur de lis medallion installed in Theresa's kitchen. 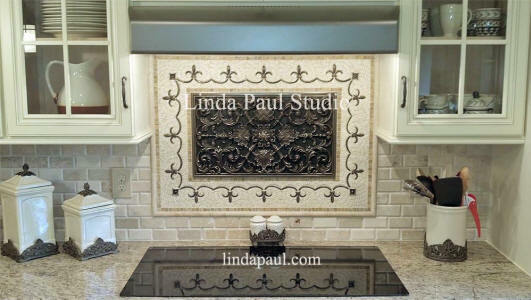 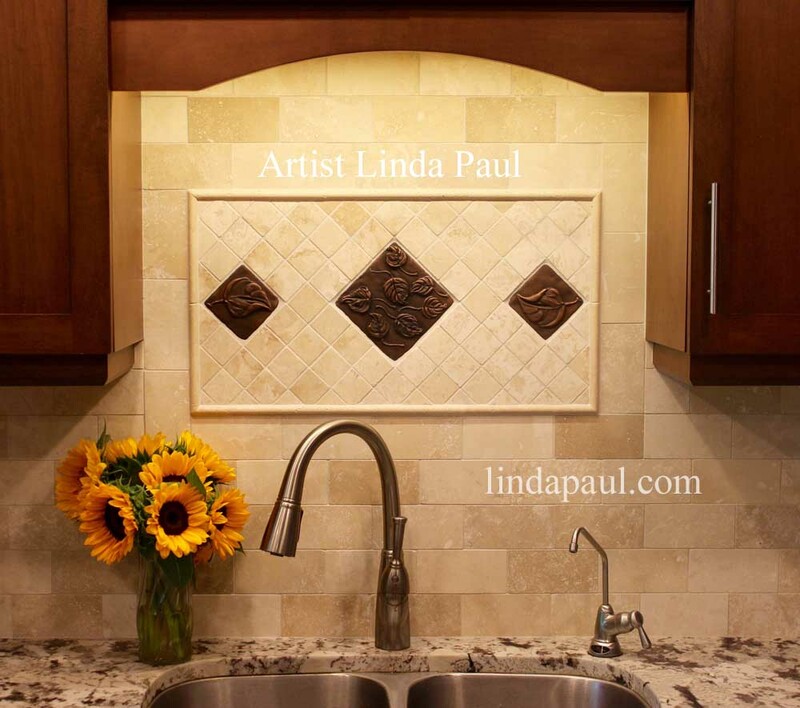 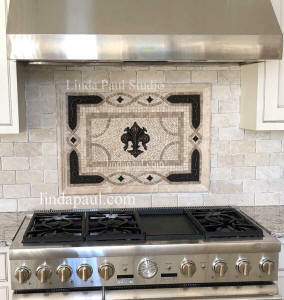 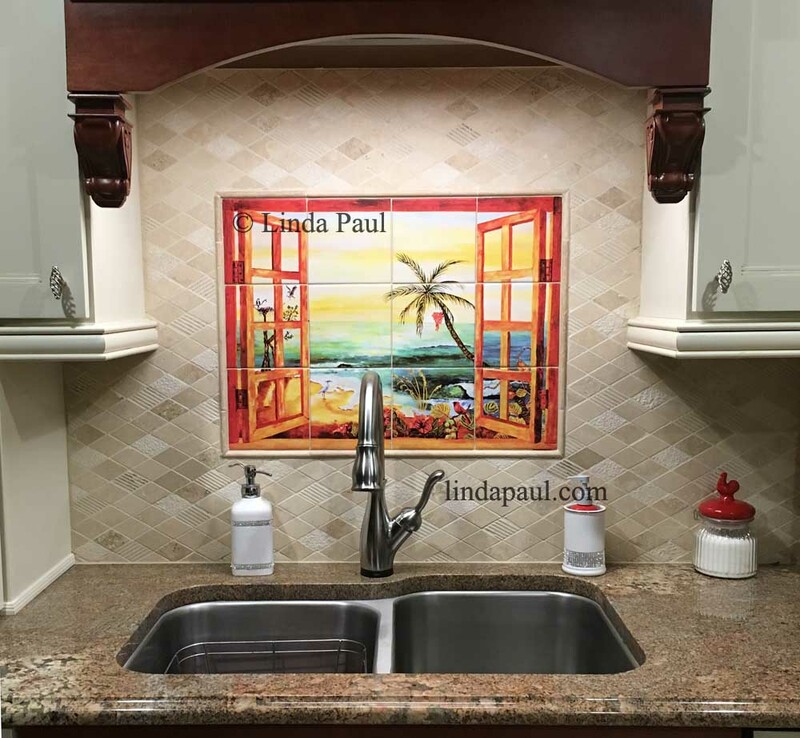 size of finished art 24" x 24"
"The Tuscany Arch tile backsplash is gorgeous and compliments the decor in the rest of the kitchen. I have received numerous comments on the backsplash on how beautiful the backsplash looks and the high quality of the tiles and positioning. Thanks Linda." 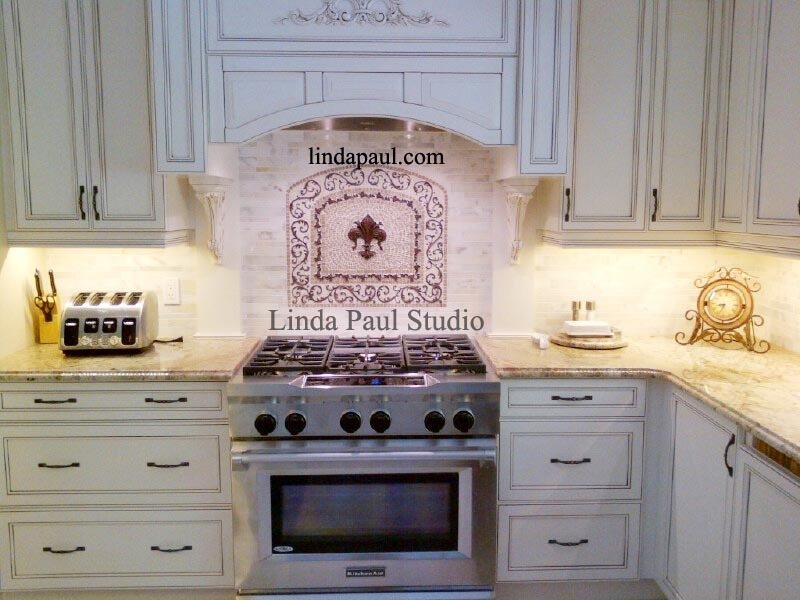 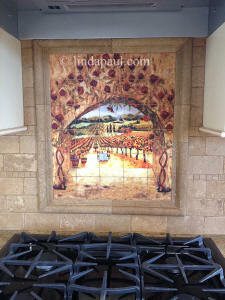 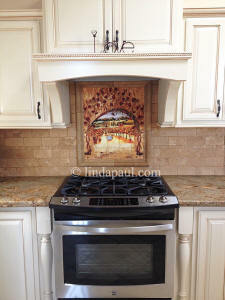 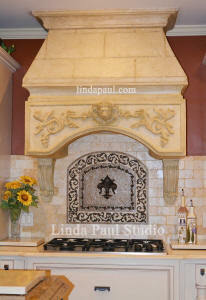 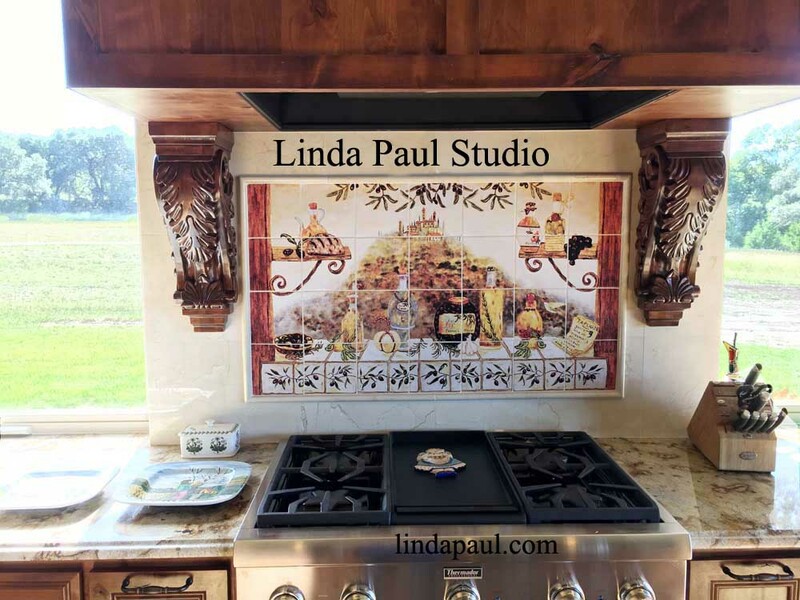 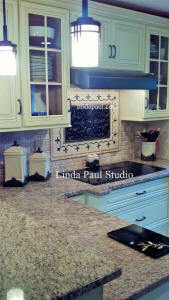 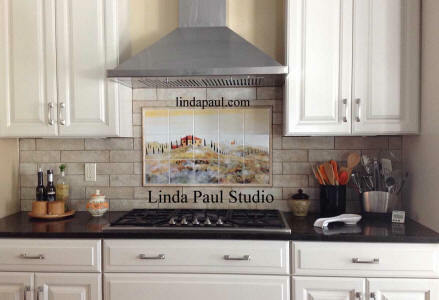 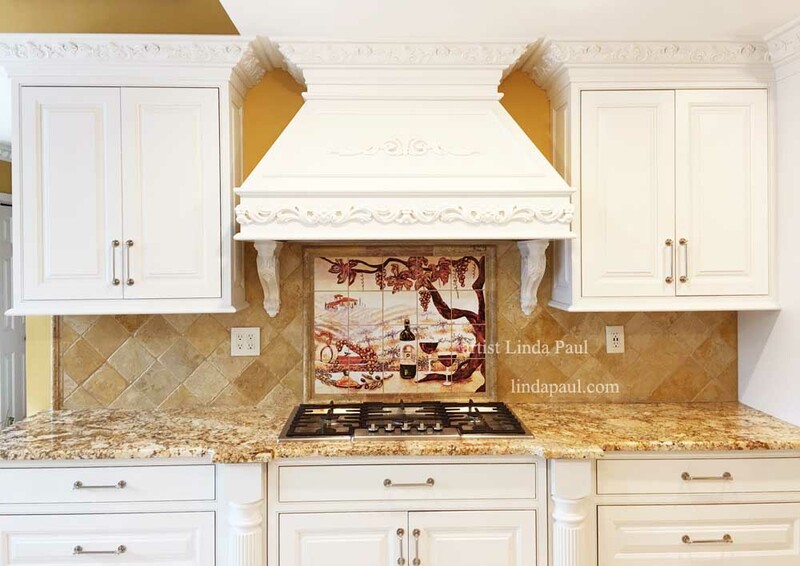 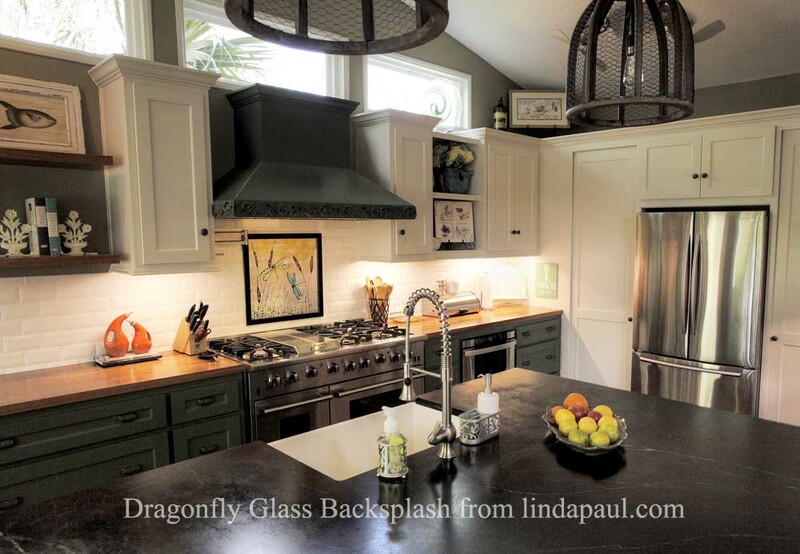 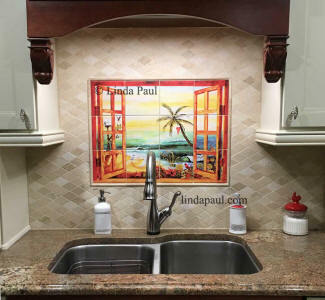 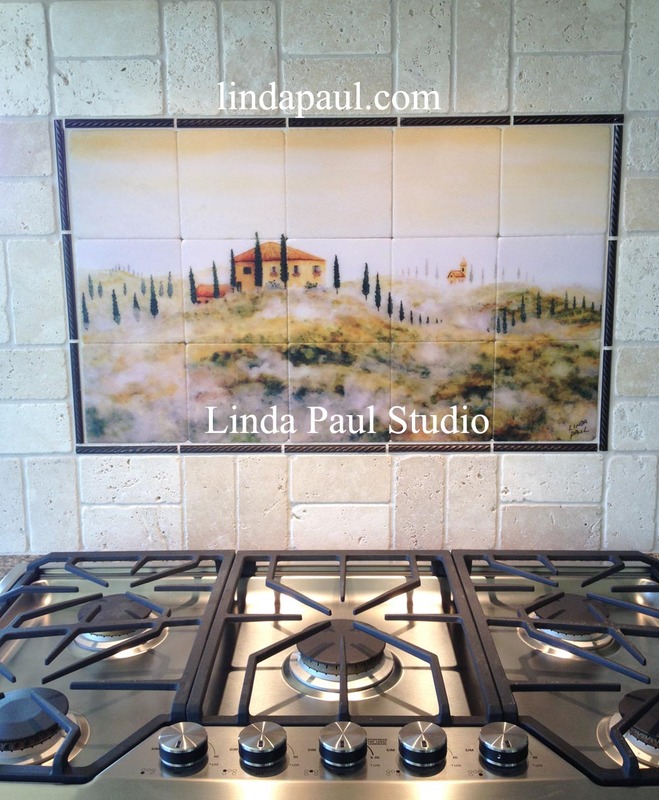 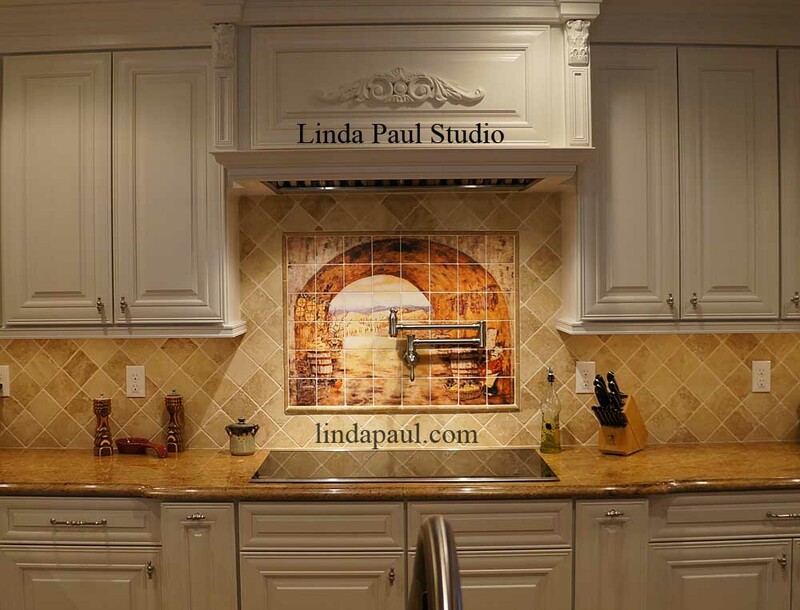 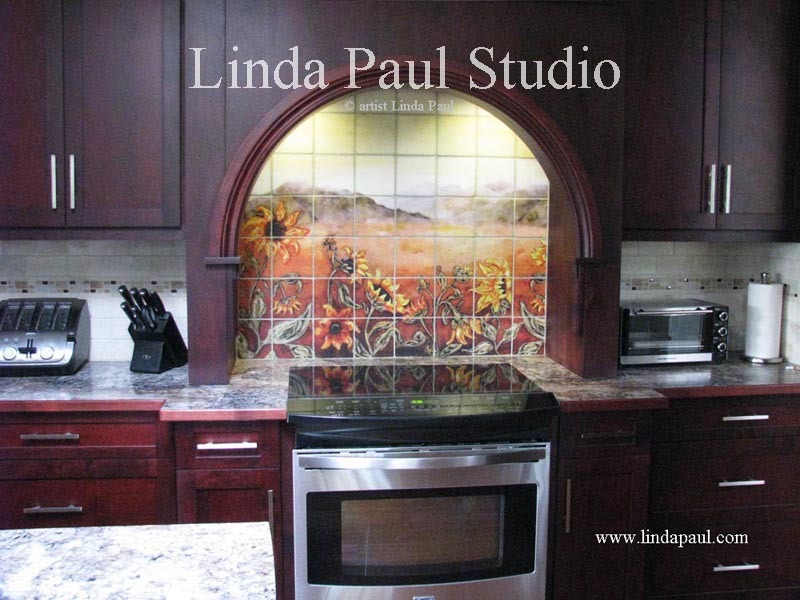 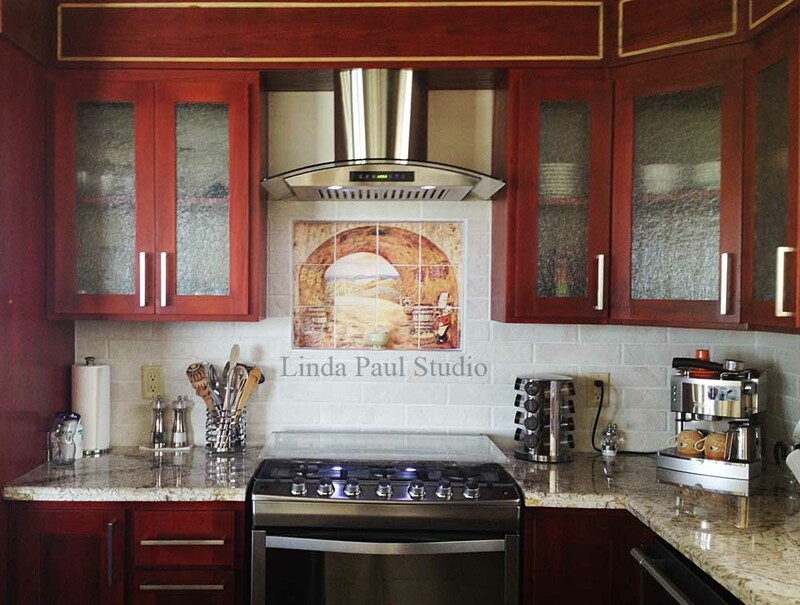 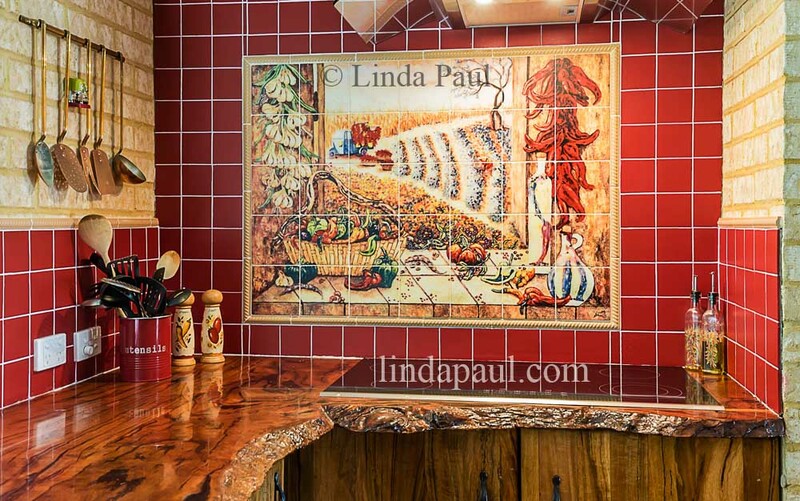 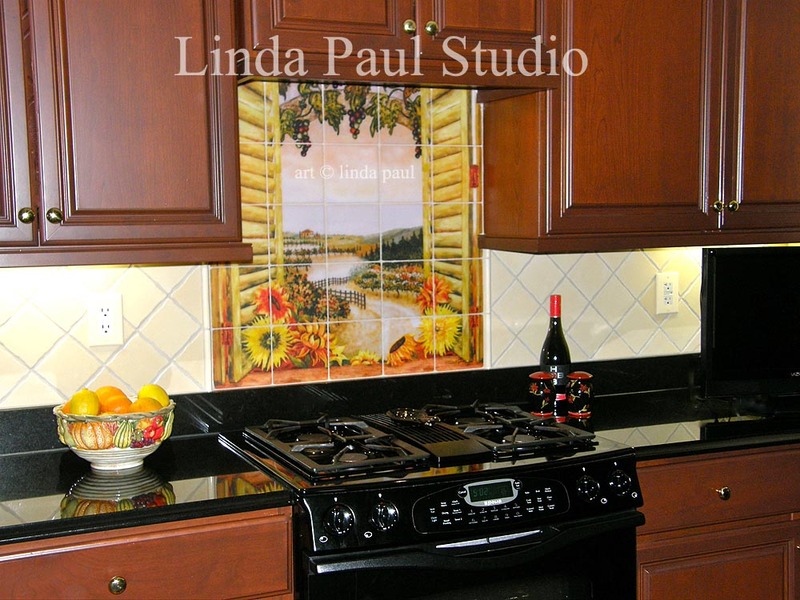 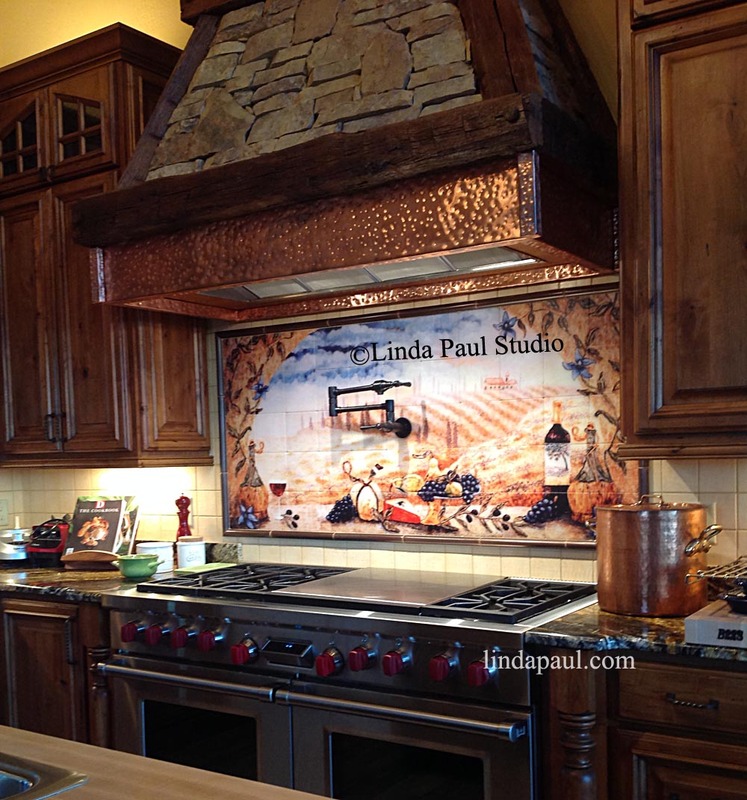 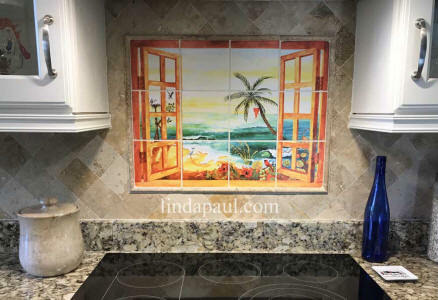 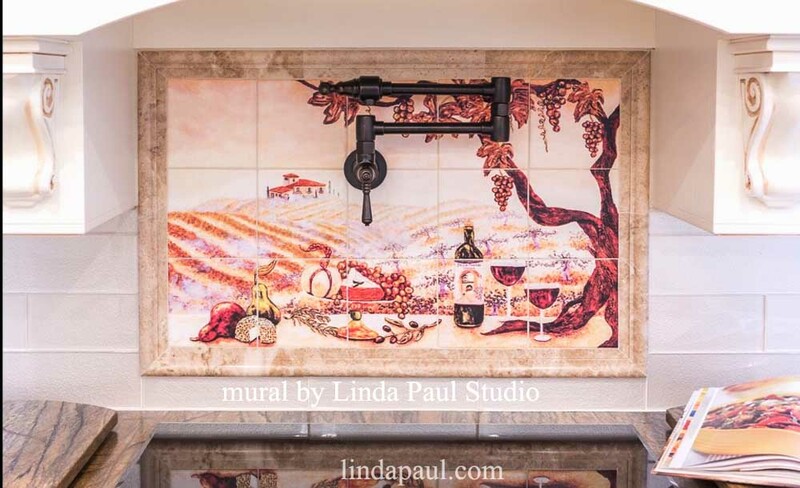 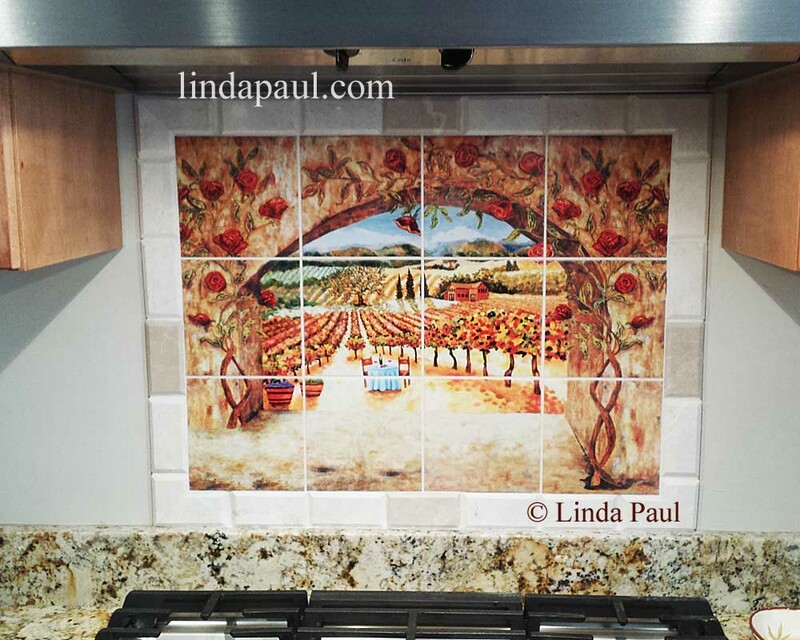 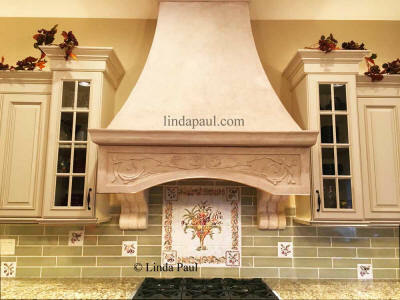 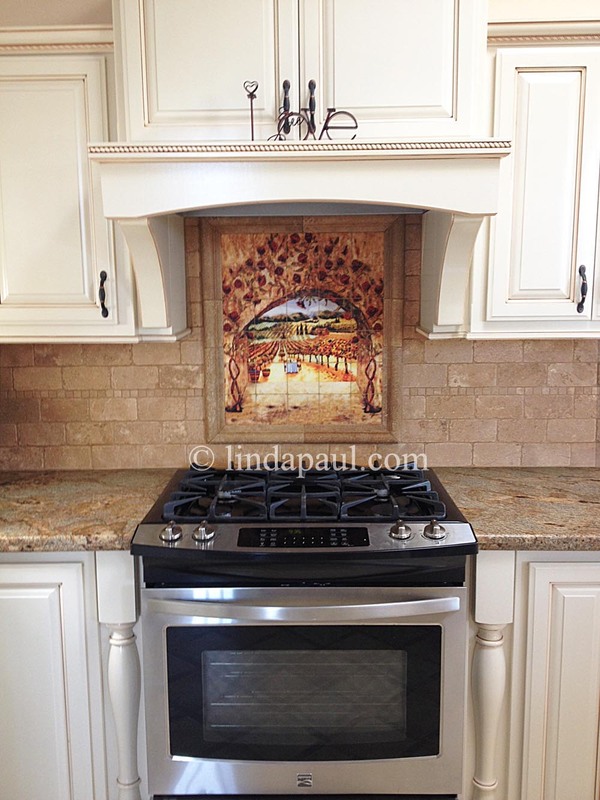 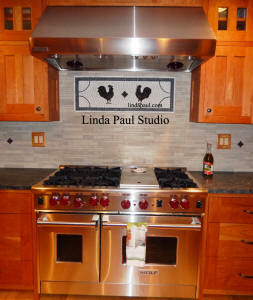 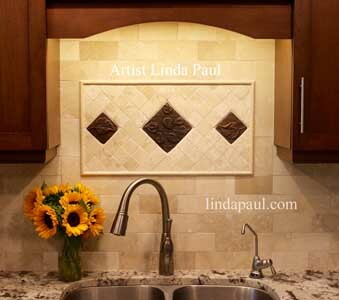 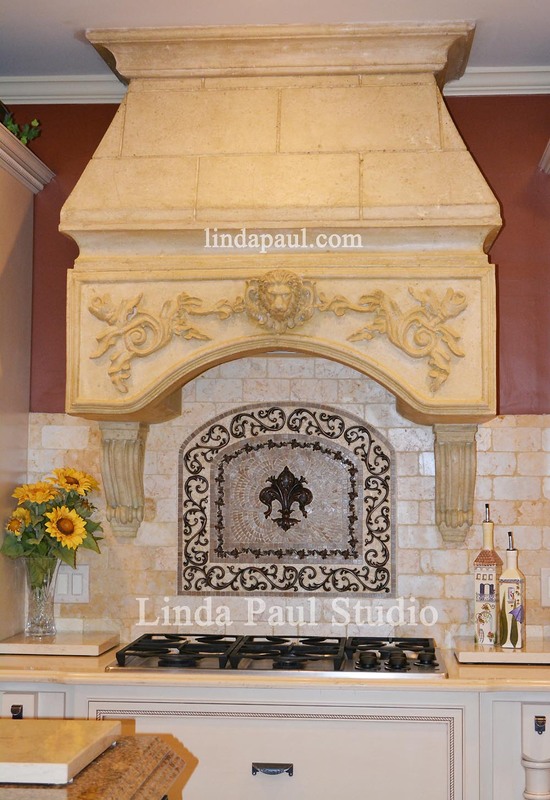 features 66" x 36" Tuscany Arch tile mural in Susanne's kitchen. 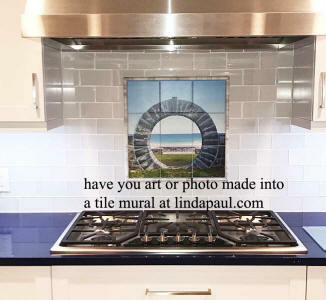 I know what it's like doing an internet search for hours trying to select an artist to do a "unique and one of a kind artwork" which in my case was for my kitchen - and then I found her site. 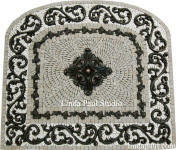 Linda's work is just so beautiful and can turn a bland space into a mini art gallery. 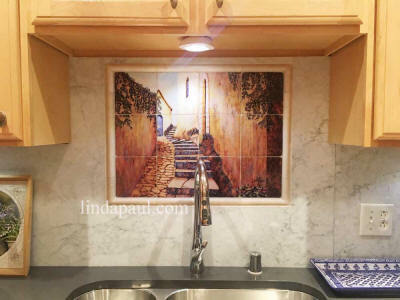 Her artistic painting on the tiles and attention to detail make this piece of art something really special in our home. My mural choice was the "Sunflowers in the Vines" and I swear to you, it looks like we had a window installed in our kitchen over the stove. 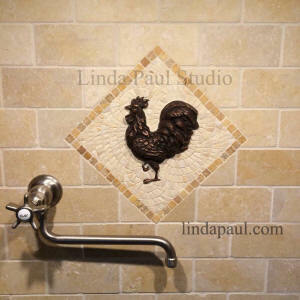 It's that realistic when finished! So, do yourself a HUGE favor and make that connection with Linda. 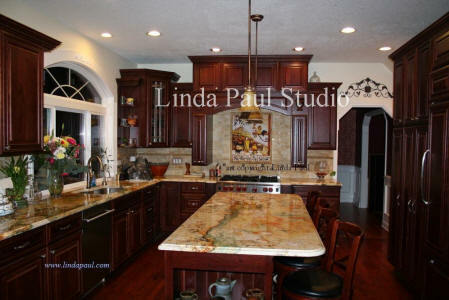 She is a delight to work with and extremely knowledgeable and helpful during the ordering process. 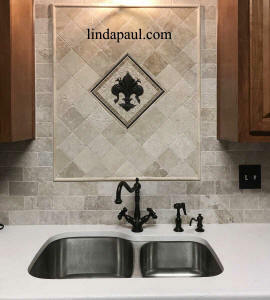 Her website has sooooo much information along with many, many pictures along with tile ideas and selections. 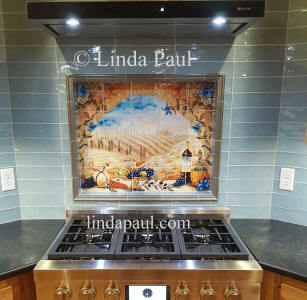 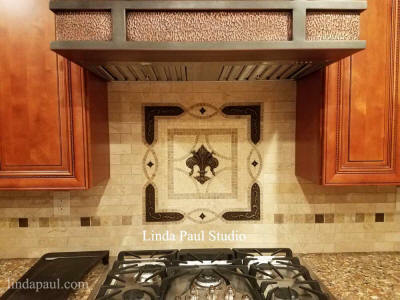 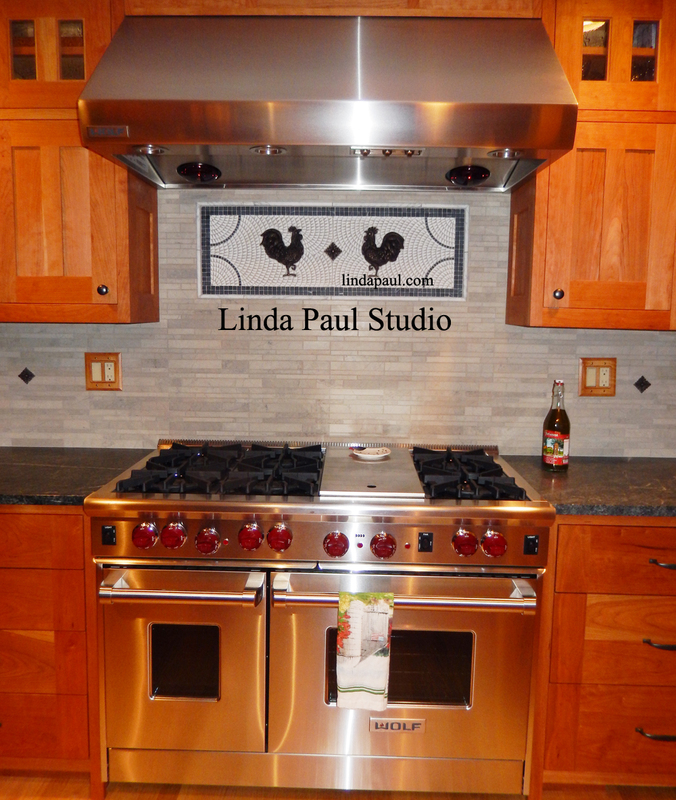 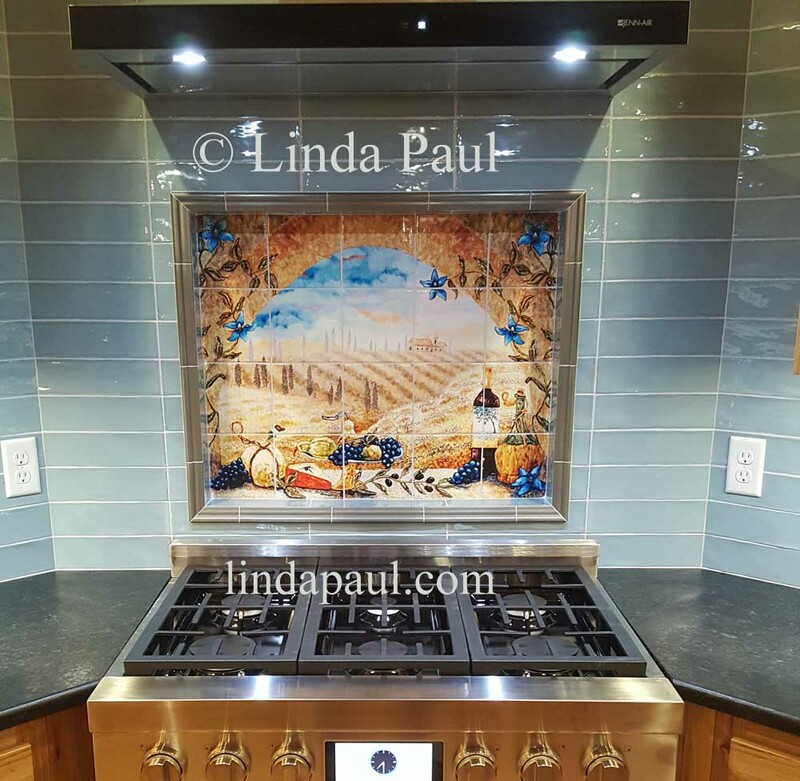 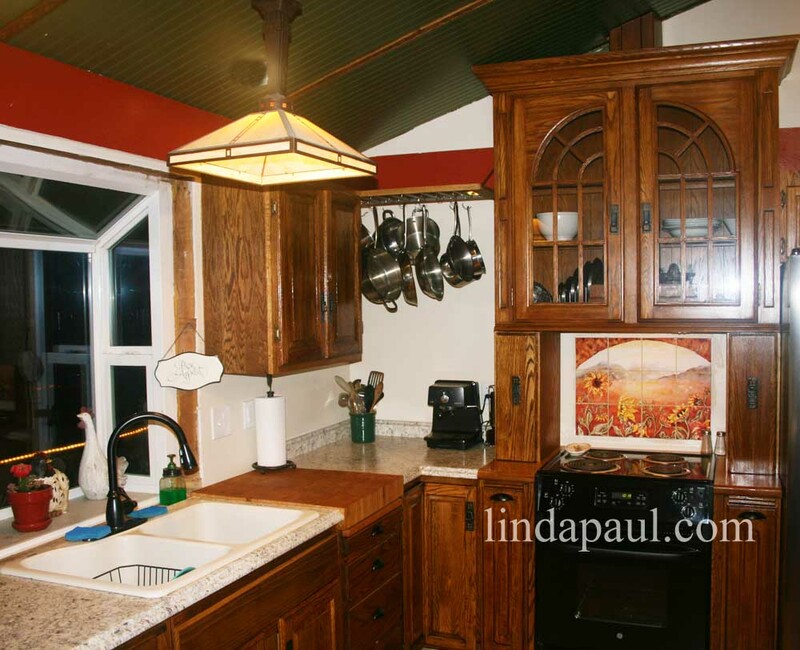 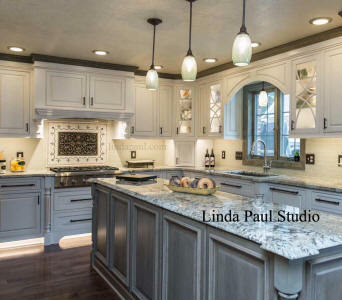 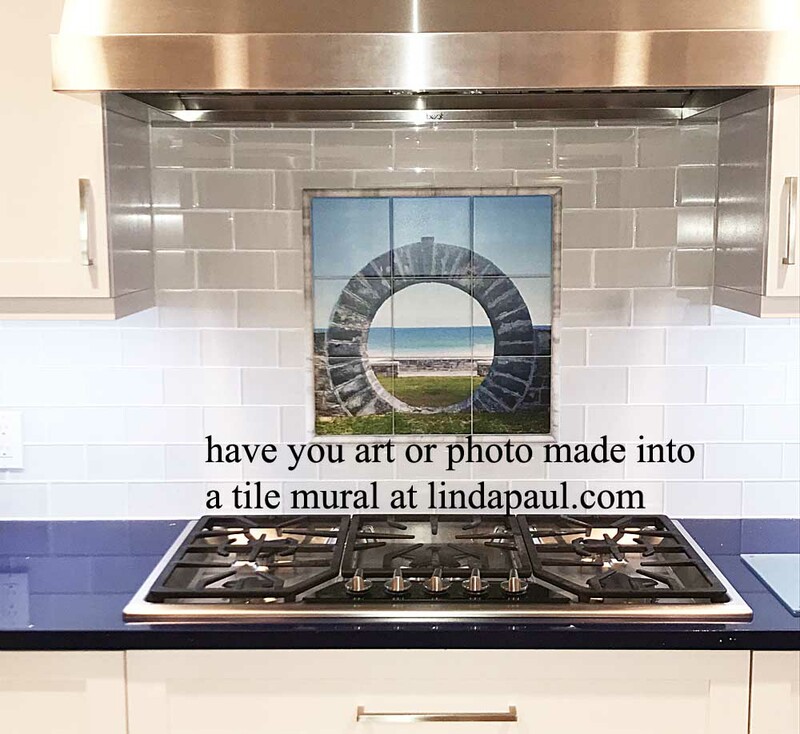 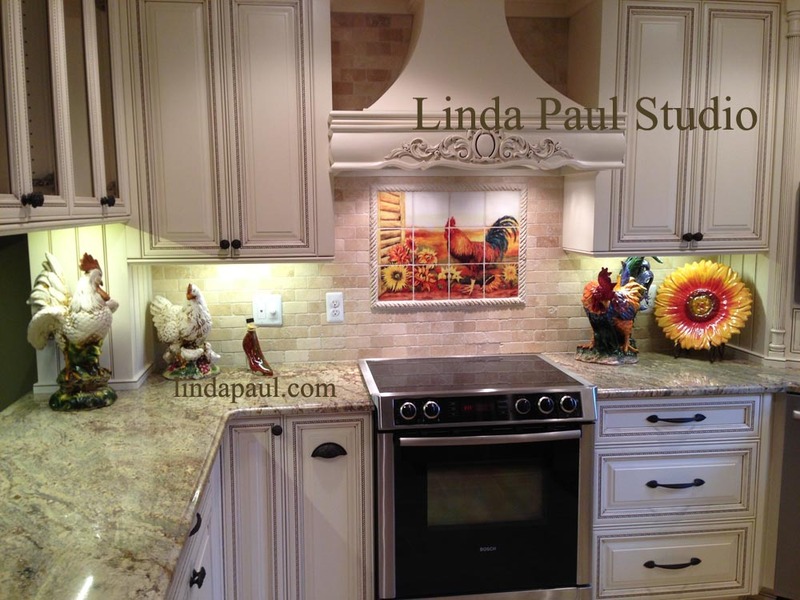 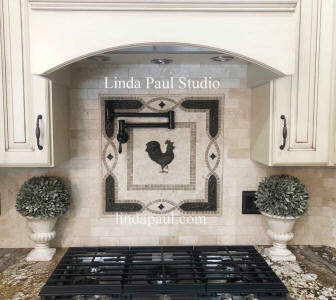 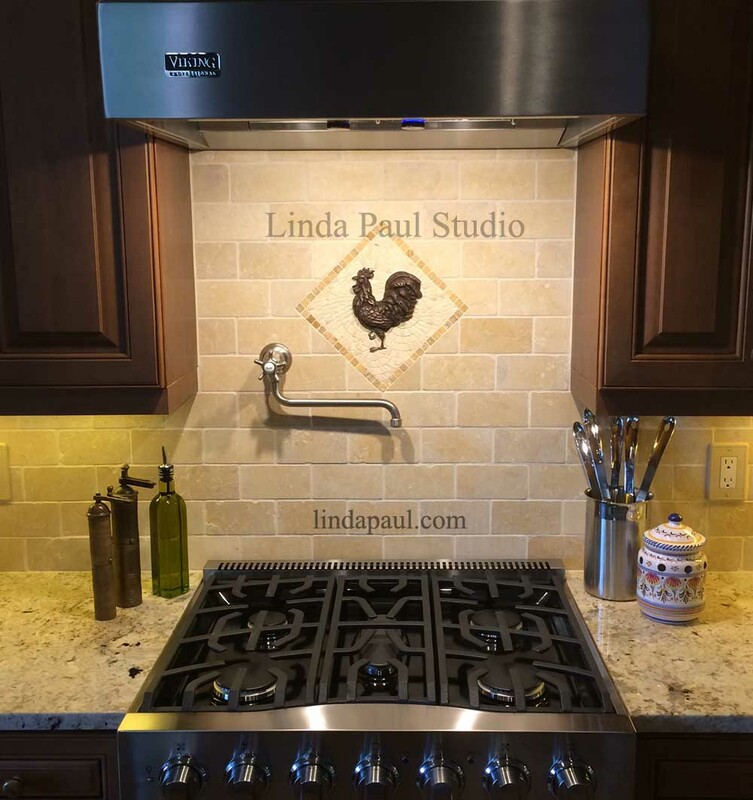 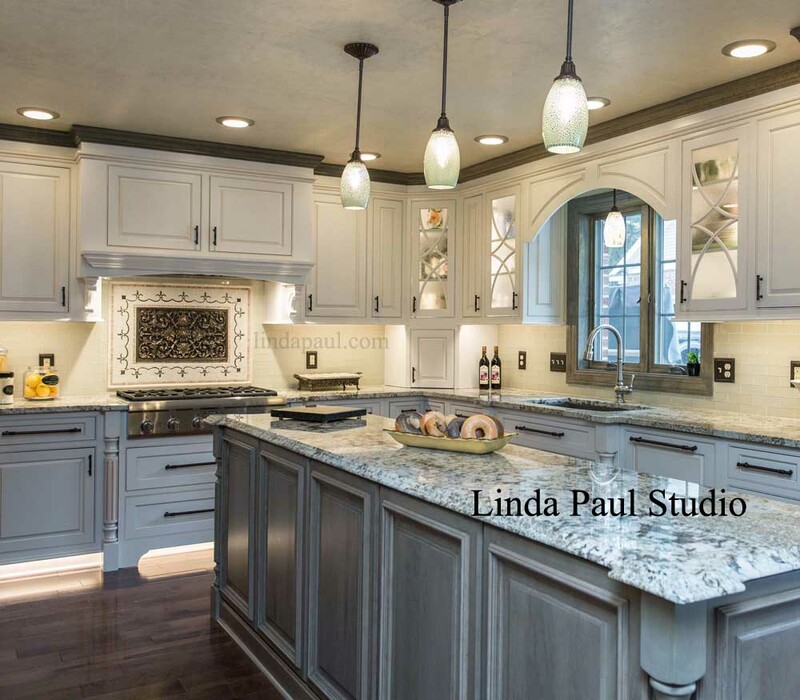 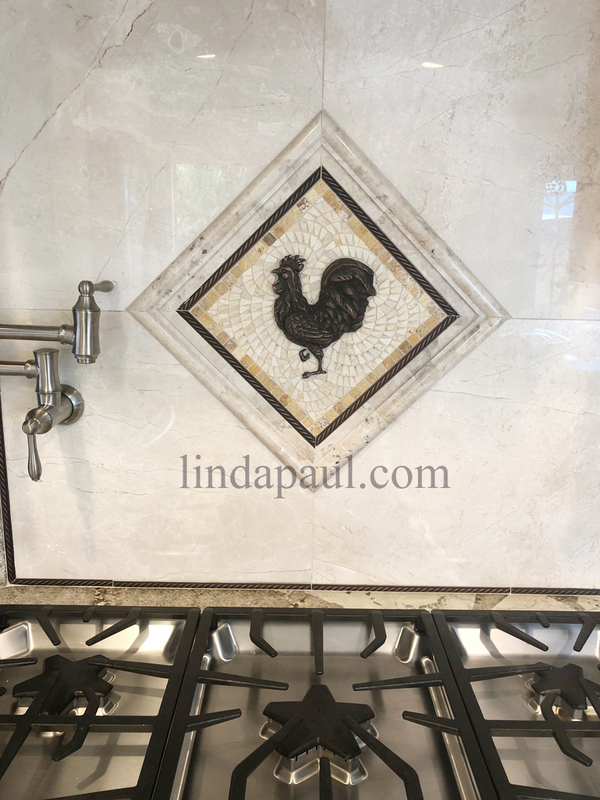 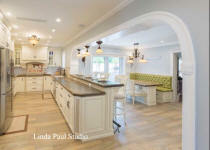 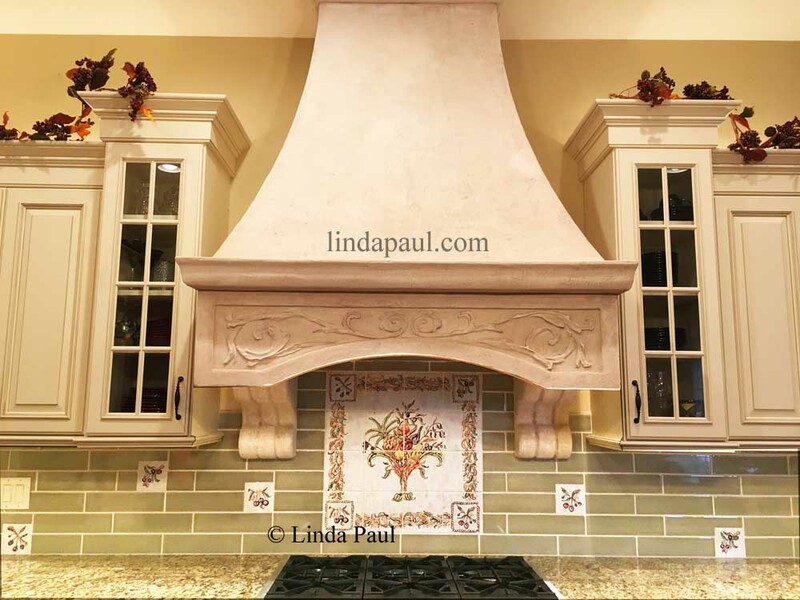 Linda, we thank you very much for enhancing our home with your beautiful work plus turning my kitchen into a showplace and making it a real treat to be cooking in such a gorgeous space! 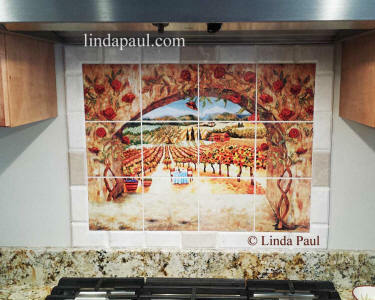 Finally after a year I am sending pictures of the tile mural. 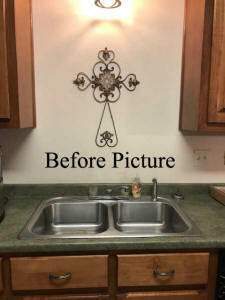 It looks beautiful, everyone loves it! It was wonderful finding your studio. 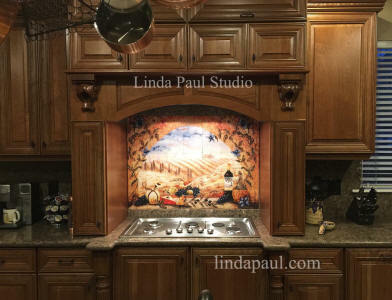 Our kitchen would not be the same without your mural Everyone who sees this mural raves about it. 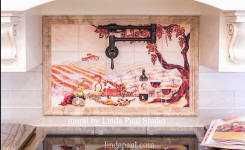 To say we love it would be a huge understatement------we are thrilled beyond words. 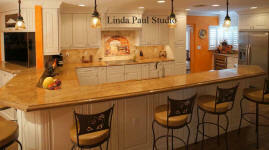 It was a pleasure doing business with you! 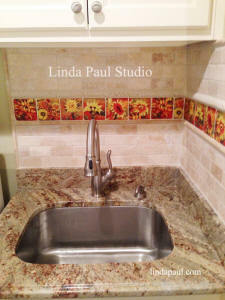 We finally installed your beautiful tiles. 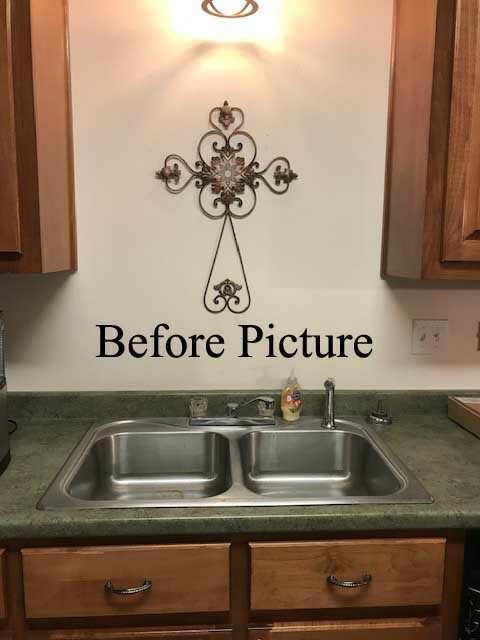 We are very glad we found your picture – Everyone who comes to our house is drawn and mesmerized by your design.